Science being conducted aboard the space station includes research on physical and biological processes that cannot be done anywhere else, applied research to improve lives on Earth, and exploration research to help humans move safely beyond Earth orbit. 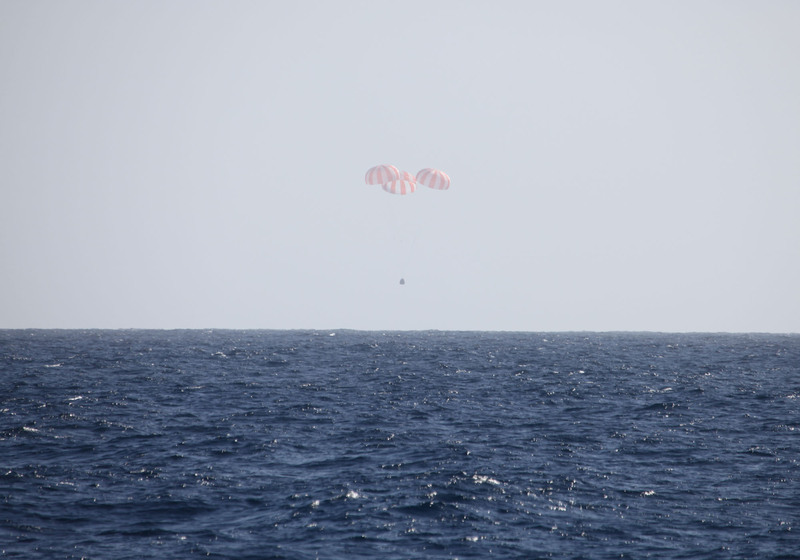 A boat was to take the Dragon capsule to a port near Los Angeles, where it will be prepared for a return journey to SpaceX’s test facility in McGregor, Texas, for processing. Some cargo will be removed at the port in California and returned to NASA within 48 hours. This includes a freezer packed with research samples collected in the space station’s unique microgravity environment. The remainder of the cargo will be returned to Texas with the capsule. Dragon is the only space station resupply spacecraft able to return a significant amount of cargo to Earth. The spacecraft lifted off from Cape Canaveral Air Force Station in Florida on March 1, carrying about 1,268 pounds (575 kilograms) of supplies and investigations. It returned about 2,668 pounds (1,210 kilograms) of science samples, equipment and education activities. The mission was the second of at least 12 cargo resupply trips SpaceX plans to make to the space station through 2016 under NASA’s Commercial Resupply Services contract. SpaceX is one of two companies to build and test new cargo spacecraft under NASA’s Commercial Orbital Transportation Services (COTS) program. Orbital Sciences Corp. of Dulles, Va., is the other company participating in COTS. A demonstration flight of Orbital’s Antares rocket and Cygnus spacecraft to the station is planned for later this year. NASA initiatives such as COTS and the agency’s Commercial Crew Program are helping develop a robust U.S. commercial space transportation industry with the goal of achieving safe, reliable and cost-effective transportation to and from the space station and low Earth orbit. In addition to cargo flights, NASA’s commercial space partners are making progress toward a launch of astronauts from U.S. soil in the next few years. While NASA works with U.S. industry partners to develop and advance these commercial spaceflight capabilities, the agency also is developing the Orion spacecraft and the Space Launch System (SLS), a crew capsule and heavy-lift rocket to provide an entirely new capability for human exploration. Designed to be flexible for launching spacecraft for crew and cargo missions, SLS and Orion will expand human presence beyond low Earth orbit and enable new missions of exploration in the solar system.